Between late January and early May of 2011 the popup on my site was temporarily disabled, which allowed me to go back through my Google Analytics reports and construct a time line of both my email subscription rate (overall site visitor to email signup percentage) and my bounce rate. I’m using bounce rate as a way to measure visitor dissatisfaction: are new visitors really turned off enough by the popup to just leave? I found that during that period my signup rate dropped dramatically. I was collecting far fewer emails from visitors. Also during that time, there was no noticeable change in bounce rates. Viewers didn’t seem to mind the popup at all. I then compared direct with-popup and without-popup numbers to get specific about the changes the popup made to my site. 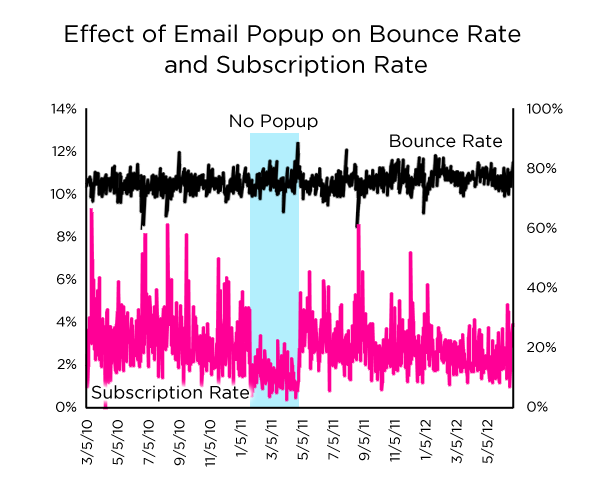 I found that my signup rate doubled with the popup and there was an insignificant change to my bounce rate. To me this i a no-brainer. It’s not even a trade off between any kind of measurable visitor dissatisfaction and more emails. It’s just more emails. So what do you think? Have you tested email popups on you site?